Why isn’t John Pham super famous? I think he’s respected by most of us who are familiar with his work, but not enough indie comics fans are. This probably has something to do with the fact that a large portion of his work has been self-published or appeared in anthologies, so it tends to reach a limited market for a limited time. Maybe he’s a famous graphic designer, but I wouldn’t know it. That’s not my scene. I’ve been a fan of John’s since I first came across his work in the early 2000s. I especially liked his design work on the video game-themed zine, 1-UP, which directly inspired my eyeglasses-themed zine, Hey, 4-Eyes! John’s signature self-published series, Epoxy, debuted back in 2000. Even back then he had chops, but Epoxy #4 is hella sophisticated. John is such a smart book designer! I love the way his publications look, his use of color in particular. 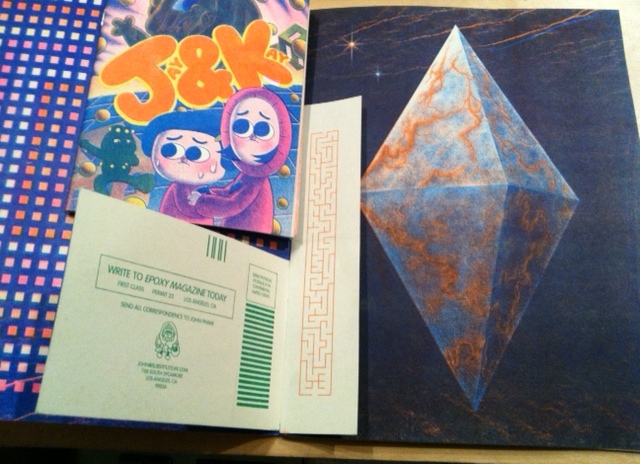 Epoxy #4 had a small inset booklet (“Jay and Kay”) and the rest of the book was taken up with the short piece “Deep Space.” And of course, there are some clever design bits, like the phony magazine subscription postcard that acts as an indicia. 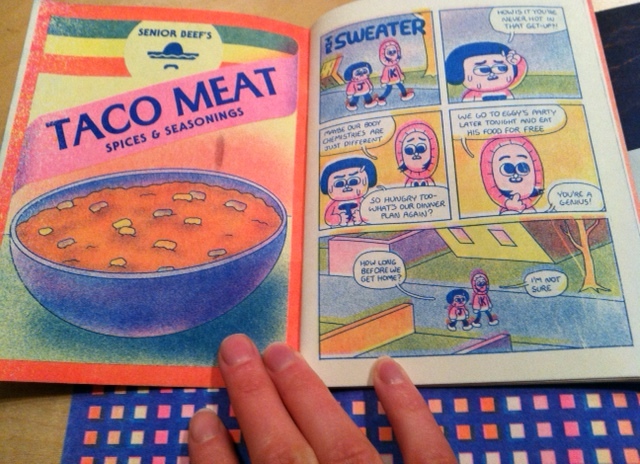 From what I can tell, this book was printed on a 3-color Risograph. 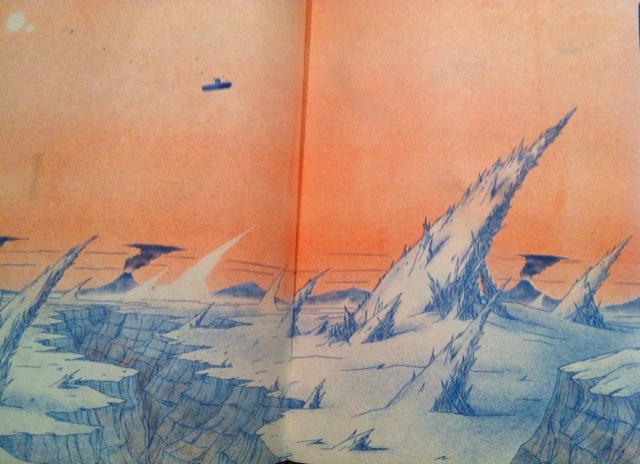 The registration is as perfect as I’ve seen with Riso (though there are a few pages where it’s off). “Jay and Kay” is made up of a number shorts about a female odd couple. It’s funny and weird and great. I love how John created advertisements based on relevant objects in the story (see Senior Beef’s Taco Meat Spices & Seasoning). “Deep Space” is a beautiful short about a space catastrophe. The story starts mid-accident without any preface. It’s spare on words and moves elegantly slow. Any ways, it’s great. 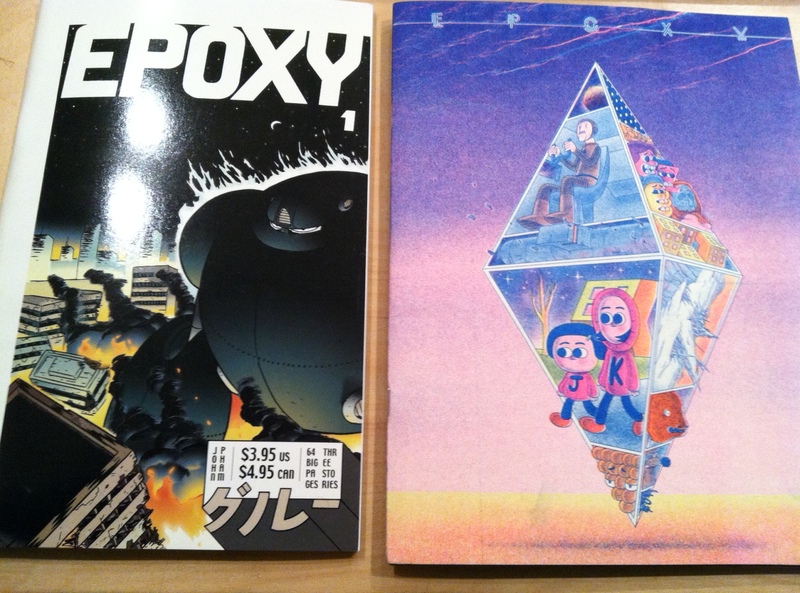 You should buy Epoxy #4, though I’m not sure if it can be ordered online. I bought mine at Desert Island, but they quickly sold out. I’ll keep you posted if I find another source. This entry was posted in Uncategorized and tagged haul, John Pham, review. Bookmark the permalink.